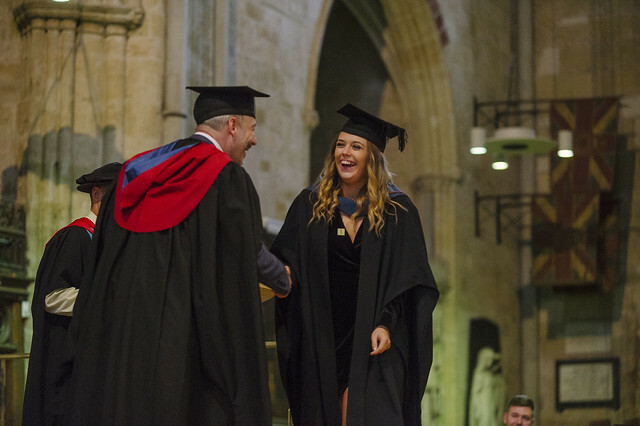 Degree Level students at Exeter College celebrated their ‘Golden’ graduation in the magnificent setting of Exeter Cathedral on Friday 12th October 2018. Hundreds of guests, friends and family, came together to celebrate the graduation of more than 165 students from the college’s Centre for University Level Studies. Students donned their gowns and caps to be awarded their degree level qualifications ranging from BA to Foundation Degrees, HNCs, HNDs in subjects ranging from photography to civil engineering. The guest speaker at this year’s event was Nicola Dandridge CBE, Chief Executive of the Office for Students. Spirits weren’t damped by the rainy weather, which prevented the annual procession through the city centre from going ahead. Exeter College is rated ‘Gold’ in the UK Government’s assessment of teaching excellence in higher education. The college is only one of 16 colleges in the country to be rated gold, alongside the very best universities. Exeter College is a ‘Gold’ rated college that offers a wide range of University Level courses with our partner universities including BA, Foundation Degree, HNC and HND programmes. University level education at the Centre for University Level Studies is a part of the college’s learning community. The college works in partnership with well-respected university partners and awarding bodies, enabling students to study in Exeter and at the same time benefit from teaching excellence and a wide choice of courses. If you aren’t quite ready for higher education, the college has a number of Access to HE programmes and other routes for you to start your higher education journey.